Cardboard sundial kit (12 pages) from original dial by Rudolf von Graffenried. Three horizontal and two vertical sundials. Can be used for latitudes from 39°N to 55°N. Gnomons and compass. Detailed construction manual and background information (German). From the 15th to the 17th century, the heyday of science and instrument making took place. Hans Lipperhey, Johannes Kepler and Galileo Galilei built the first telescopes. Georg Peuerbach and Regiomontanus introduced the earth-parallel gnomon in Europe. John Harrison solved with his precise chronometers the problem of calculating longitude while at sea. During this time, the scholars Rudolf von Graffenried and Georg Brentel the Younger dealt with the timekeeping and especially sundials. They wrote books and articles about the timekeeping with the sundial and the necessary instruments they attached as cutting sheets to the textbooks. The dials had to be cut out by the customers, glued to a wooden plate and then tilted at a certain angle to the ground to be functional. Exclusively at Helios sundials, the studied graphic designer Jens Schmitz-Scherzer now presents his hand-drawn, meticulously crafted cardboard kits based on the original dials of the two brilliant gnomonicians. Enclosed you find a well-understood construction manual (German), a detailed instruction manual and a small treatise on the time measuring. In addition, Prof. Dr. med. Karl G. Hofbauer wrote a biography of the designers. 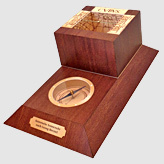 With a little craftsmanship come out of it fully functional sundials, equipped with a compass and gnomon. This extraordinary polyeder sundial with the original dial by Rudolf von Graffenried has three horizontal and two vertical sundials. The latter are each 45 ° from the south east (ORIENS) or west (OCCIDENS) deviating. Their gnomons are also used for the horizontal sundials for time display. On the pedestal you can find another horizontal sundial with its own gnomon, which displays all day. All dials show the true solar time (LAT). This was the valid time of the civil life until the 19th century. The sundials are calculated for 47 ° N. With the help of prisms, the sundial can be tilted for different latitudes between 39 ° N and 55 ° N. The built-in compass allows you to align the sundial to the north.